What is the biggest beauty killer for your face? Some may say pimples, some may say oily skin, but probably majority will say it’s bad teeth. Regardless of your skin color, face structure or skin type, bad breath, and dirty teeth are the things that keep people away from you. Nowadays, people are concerned about healthy lifestyle, and a major part of that concern should be the teeth. Gladly, products like Waterpik Complete Care Water Flosser and Sonic Toothbrush, WP-900 comes with complete package for your teeth. Keep one set at home and going to a dentist will just be a formality. The way teeth are ordered inside our mouth is a tricky thing. There are lots of points where traditional brushes cannot reach, there are plaques normal brushes cannot clean at once. The sonic toothbrushes give more attention to these difficult tasks, by vibrating at a speed of 30,000 to 40,000 strokes per minute. This huge vibration creates lots of motion and energy, directing mouth fluids (saliva, toothpaste, water) below the gum lines and in between teeth. That’ll deal with the areas where bristles cannot reach and provide you a truly better feeling than traditional brushes. Almost half population of America don’t floss every day, and around 20% don’t floss at all. One of the reason might be they don’t like using flossers at all or find it inconvenient to use. However, there’s no doubt flossing is important for healthy teeth, unless you want plaque and food particles to gather and deliver you a painful experience later. Water flosser isn’t an optional choice anymore. People who experience gum disease, bleeding, dry mouth or use braces, should definitely try out water flosser. 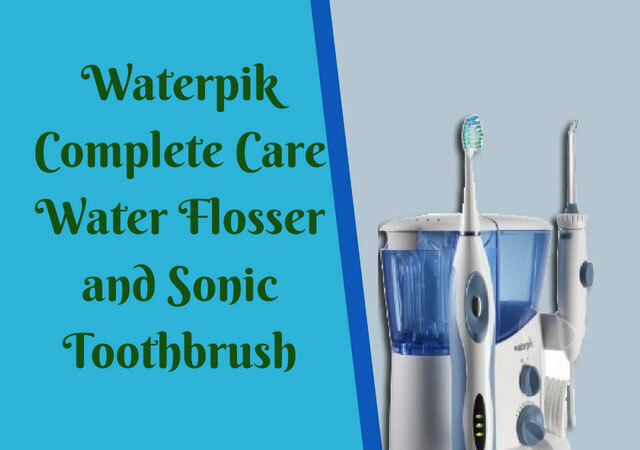 The Waterpik complete care wp900 water flosser and sonic toothbrush is the most highlighted and premium product of Waterpik. This is a convenient device that brings the most effective method of brushing and flossing together. However, there is a different between Waterpik 900 and other electronic toothbrushes. While most of them just provide vibrations and nothing superfluous, Waterpik combines both pulsations and water pressure to flush out stubborn food particles. This popular product has been tested and was proven to clean plaques up to 52% efficiency. Users had experienced quick results after the first few uses. This product was made as a home gum health supervisor. While lots of electronic toothbrushes even bother to address, Waterpik improves the condition of your gums by 70%. Since you are using it for brushing your teeth, there’s no way you can keep water out of question. Don’t worry though, Waterpik 900 is water resistant, so use it under the shower with no worry. It’ll withstand some hard falling from hands too! The Waterpik sonic toothbrush provides 25% faster speed than its counterparts. Which means, it’ll rattle the old and stubborn plaques even better. It operates at a high speed and reaches 30,500 strokes per minute eventually. It has two-speed settings, if you find high-speed settings unsettling, go for the lower one. The sonic brush signals you every 30 seconds, in 4 installments. Which means 2 minutes for your whole teeth, 60 seconds for the top part and 60 seconds for the bottom part. The package comes with two brush heads, one standard, and one compact. The toothbrush comes with a suitable, strong travel case that doesn’t lock moisture. Rather, it allows air to flow through it. However, one problem is the toothbrush doesn’t come with a separate charger. If you have to stay out long, the battery might run out. So, you have to be prepared to use it as a manual toothbrush. Not comfortable with higher water pressure, or finding it too low? Waterpik WP-900s flexible water pressure lets you stay in the comfort zone. It has 10 pressure settings from 10 PSI to 100 PSI. Braces, implants, general use or any other types? The Waterpik Complete Care WP-900 comes with different tips, so you can choose one according to your requirement. The tank can hold 23 ounces of water. Since the device uses 13 ounces of water per minute, you will get a non-stop flossing session of 1.5 minutes. This will meet the recommended flossing session of 1 minute easily. The tank can be cleaned easily by any dishwasher. The tank can be removed and attached easily for each filling. You can even detach the tank lid so that it doesn’t disrupt the movement of the flosser. The storage space for replacement tip and the brush head is the reason people love this one-stop solution. You don’t have to worry about storing the 2 flossings, 5 replacement tips, and other tips in a separate place. The Waterpik flosser is a countertop, so it can stand on the base, and difficult to pull to the ground. A hard-sided, premium travel case. The Waterpik Complete Care system. Two Heads- Standard and Compact. Five Tips- 2 Classic tips, 1 Plaque seeker, 1 Orthodontic tip, 1 Pik Pocket. 159% more effective than regular manual brushes. Complete package- sonic toothbrush and water flosser with different tips. Improves gum health in 2 weeks, removes plaques efficiently. Affordable, best sonic toothbrush for the money. Doesn’t come with a separate charger for the toothbrush. It’s great for home, great for short travels, but not so great for long travels. If you trust public opinion, then you should definitely go with Waterpik Complete Care Water Flosser and Sonic Toothbrush, WP-900. It has got high ratings from thousands of users like you and me. This is the best sonic toothbrush right now because from brush head to speed settings to flossing tip types, it covers every people with different dental needs. You’ll love to experiment with the variations and find a comfortable arrangement for yourself. The water flosser looks like a great alternative to string flossing. Would love to try one!